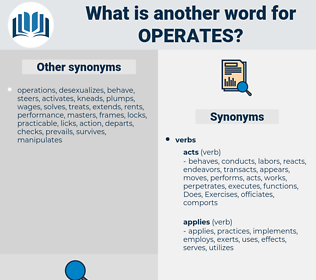 What is another word for operates? endeavours, desserts, Efforts, exploits, functions, extensions, shipments, lies, triggers, ranges, runs, switches, turns, Lights, Drives, activates. 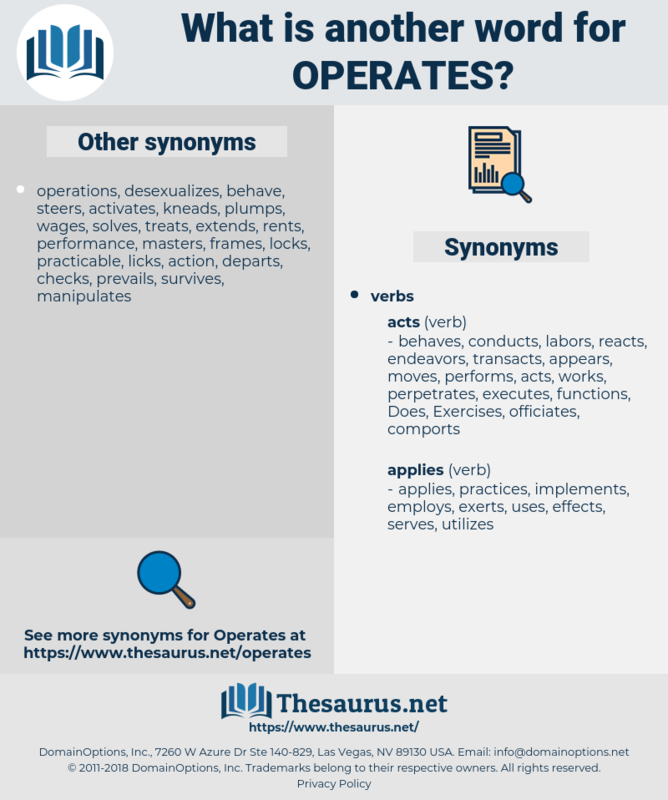 rotates, participates, circulates, collaborates, incorporates, exists, regulates, concentrates, administrates, orchestrates, demonstrates, coordinates, presentations, implementation, articulates, open, opens, routes, elaborates, anticipates, presents, consolidates, updates, translates, promotes, Activities, creates, integrates, management, advocates, progresses, employs, corporations, proceeds, performs, stipulates, implement, implementing, implements, reacts, practice, environmental, responds, constitutes, complete, completes, Travels, relates, supports, possessed, possesses, treats, represents, action, actions, organises, executes, interventions, proposes, notes, caters, Managing, manages, practises, governs, conducts, appears, contributes, adopts, corporation, regroups, intervention, response, preoccupies, retains, organizes, intervenes, accepts, situates, thrives, devotes, enterprise, protects, Addresses, targets, persists, boasts, moves, states, Manifests, purports, prevails, handles, interacts, prepares, harnesses, headquarters, environment, encroaches, monitors, battalions, enjoys, Guarantees, Affects, activity, speaks, current, unites, encompasses, compensation, comprises, utilize, utilizes, Carries, contends, produces, develops, pertains, Flourishes, matures, affords, offers, use, uses, accomplishes, harvests, Roles, mandate, mandates, utilises, complements, favours, exempts, exerts, establishes, features, reflects, introduces, occupy, occupies, enrolls, remains, arises, directed, directs, SITS, stays, prescribes, FORMATS, Bears, attends, resides, working, enforces, programme, behaves, explodes, evolve, evolves, provide, provides, serves, poses, sustains, undertaking, undertakes, relies, belongs, submissions, arranges, application, suggests, revolves, presides, attempts, spearheads, starts, occurs, supervises, preserves, service, services, delivers, Rests, disposes, dispenses, imposes, confronts, refers, company, endorses, displays, steers, contains, owns, society, is, Grants, grows, argues, installs, registers, program, Plays, varies, Lectures, declares, applies, exhibits, waivers, expires, Strikes, draws, adheres, foresees, happens, pursues, Comes, continues, observes, allows, concerns, complies, dovetails, enrols, effect, depends, oversees, ties, overturns, strives, turn, helps, awards, expects, consists, interferes, Exercises, holds, Leaves, stands, takes, consumes, embodies, extends, understands, checks, follows, accords, enters, outlines, subscribes, assumes, wields, reads, events, realises, compels, obeys, agrees, Tracks, commits, select, identifies, convenes, controls, walks, receives, assists, launches, reigns, conforms, lays, flows, entails, hosts, emerges, accedes, Lives, reaches, leverages, realizes, intends, spends, shares, feeds, looks, causes, upholds, aims, emphasizes, hears, leads, becomes, form, Forms, steps, Hoc, discharges, stems, combines, policy, commands, submits, determines, pays, place, places, briefings, cares, supplies, deals, Everything, fights, regards, changes, involves, marks, defends, succeeds, modifies, sets, tends, assures, Faces, reduces, endeavours, okay, covers, sends, achieves, attaches, goes, satisfies, needs, highlights, hits, derives, falls, feels, farm, farms, driver, aligns, seats, envisages, discusses, ensures, camp, CAMPS, shifts, pledges, fails, passes, drive, keeps, fulfils, account, accounts, secures, fulfills, shows, ensues, insures, guides, functions, Lends, implies, unfolds, mission, adds, specifies, brings, basis, embraces, twists, With, Focuses, seeks, spins, pushes, Has, fits, ranks, case, puts, sounds, builds, hinges, sees, seems, funnels, defines, tries, Gives, wishes, includes, Houses, lies, chairs, finds, counts, Fishes, wants, triggers, heads, Backs, calls, meets, ranges, Does, means, base, Bases, thinks, ai, runs, 's, gets, makes, actuates, switches, turns, Drives, activates. administer, administers, exploited, maintains, engages, lawyer, exploits, operations. It operates in two ways; first, by a curious fallacy about " the time not being ripe" - as if time could ever be ripe. The charm operates to this result through the imagination.